• LIVE • STREAMING VIDEO FROM THE DANIA BEACH BAR GRILL MUSIC WEB CAM LOCATED IN BEAUTIFUL DANIA BEACH, FLORIDA • HAPPY HOLIDAYS TO YOU AND YOURS FROM ALL OF YOUR FRIENDS AT THE DBBAG! WE WISH YOU A SAFE AND HAPPY HOLIDAY SEASON! HAPPY HOUR STARTS EVERY-DAY AT 4PM WITH $2 BEERS & $3 GLASSES OF WINE • JOIN OUR MAILING LIST ——–> AND YOU’LL BE ENTERED TO WIN SOMETHING GREAT • WE’LL BE ANNOUNCING THE GIVEAWAY SOON • IF YOU LIKE THE CAMERA, LEAVE A COMMENT IN THE FIELD BELOW! HOPE TO SEE YOU SOON! 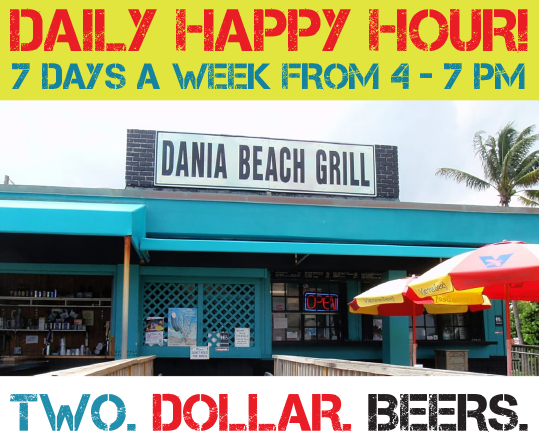 • HAPPY HOLIDAYS FROM ALL OF YOUR FRIENDS AT THE DANIA BEACH BAR GRILL MUSIC! DARK RIGHT NOW? CLICK HERE TO SEE THE DAYTIME VIEW! Stay up to date with news, information and special events from The DBBAG!